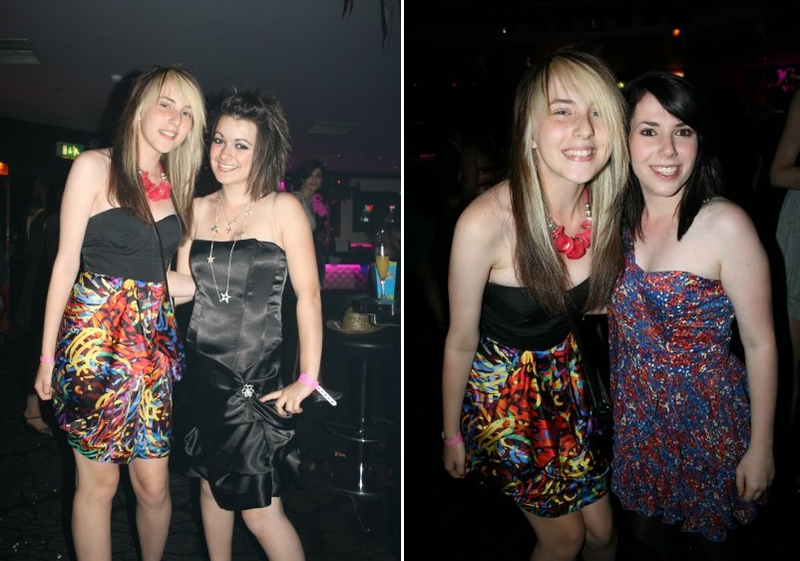 We had a "Leavers Ball" rather than a prom at my school - nowadays people that are still there seem to wear proper full on gowns and cocktail dresses, but ours were slightly more "clubwear" style like yours! I, of course, managed to pick a dress that not one, but two other girls were wearing!! They were different colours but still noticeably the same since they were block colour dresses from French Connection - I did find out afterwards that theirs were continuation lines though whereas mine was a limited edition Fashion Week one (not that I had a clue at the time! ), so at least I know that mine was slightly more special than theirs, oops! You should get yourself a tiara and make a sash that says "Prom Queen." (You can get supplies from a costume store or Michaels). If you have a date, get him a crown and a Prom King sash. You could specify that people wear 80's style prom dresses with big poofy sleeves. They could have big hair do's and 80's make up. Or you could have people dress up as the different high school stereotypes. You could be prom queen, but other people could dress up as cheerleaders, nerds, football players, goth, band geek, etc. If you want it to be like prom, try to get a backdrop where people can get their pictures taken.